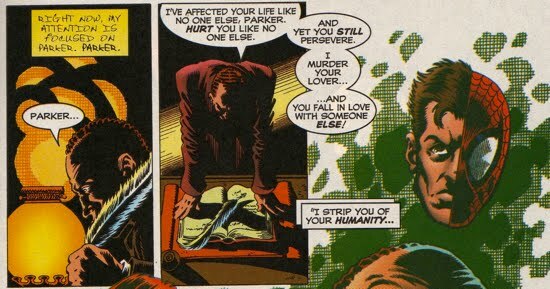 Despite the fact that Norman Osborn was impaled by his Goblin Glider at the conclusion of Amazing Spider-Man #122, Peter Parker did not feel an overwhelming sense of retribution. And as Peter walked away despondently, he left Norman behind in his Green Goblin attire for the villain's identity to be discovered by the police. However, Norman was not revealed to be the Goblin publicly because his son Harry, who observed the "final" battle between Peter and Norman, removed the costume from his deceased father. For a more detailed look at the ramifications of this event on Harry click HERE. For a thorough synopsis of the attempts to dissuade the public from uncovering the true identity of the Green Goblin click HERE. 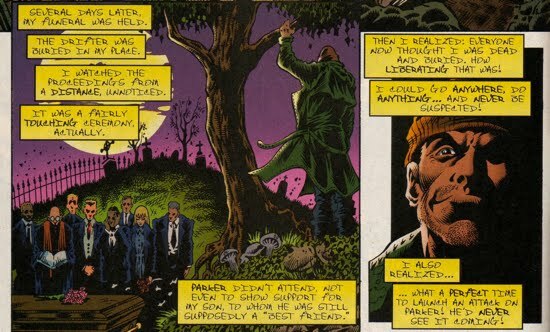 The focus of this section is to examine Norman's actions during his clandestine life in Europe prior to his official return to Spider-Man's life in Peter Parker Spider-Man #75. The most important source of information on Norman's actions while in Europe is the one-shot aptly named Spider-Man: The Osborn Journal. In this one-shot, Norman explains "everything" (I placed that in quotations because later stories will retcon his exploits during the years he was "dead" as seen later in this section). It is clear that Norman's obsession with Spider-Man did not diminish while in Europe. In fact, it intensified; and many of the adversities that Spidey faced during the years Norman was thought dead were engineered by the Goblin himself. The following is an account of the events that comprise the years Norman spent hidden in secrecy. When Norman 'awakes' in the morgue he is unsure how long he has been "dead". He soon realizes that the Goblin Formula that gave him tremendous strength and intelligence also granted him and incredible healing factor, thus allowing him to evade death. Norman then observes Harry bribing the coroner to fake the autopsy, so that there will be no detection of the Goblin Formula in his body. Soon after, Norman kills a homeless drifter (of a similar body type) and places him in the morgue to be buried in his place. Norman then attends his own funeral and he comes to the conclusion that with everyone believing him dead this would be the best time to get his revenge upon Spider-Man. 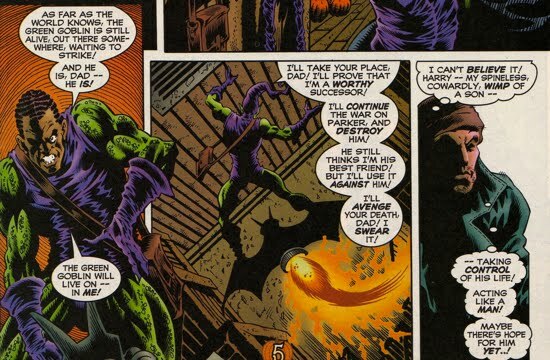 As he returns to one of his Goblin hideouts, he finds Harry vowing revenge upon Spider-Man in his father's name. Norman decides to step back and let Harry have a chance to "prove himself". 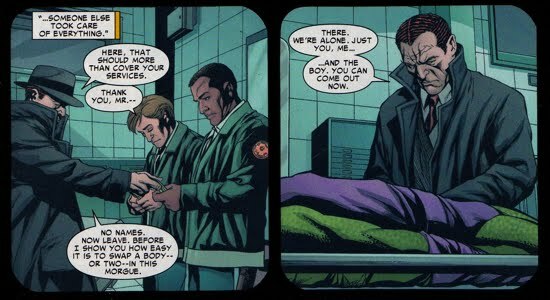 The significance of this era of Norman Osborn's life is that from the moment he awoke in the morgue, he is undoubtedly aware that he is the Green Goblin, his amnesiac episodes are over. Norman soon resolves to move to Europe where he can "move freely and unrecognized". In Europe, he sets up a comprehensive information network to be able to monitor everything going on back in the U.S. 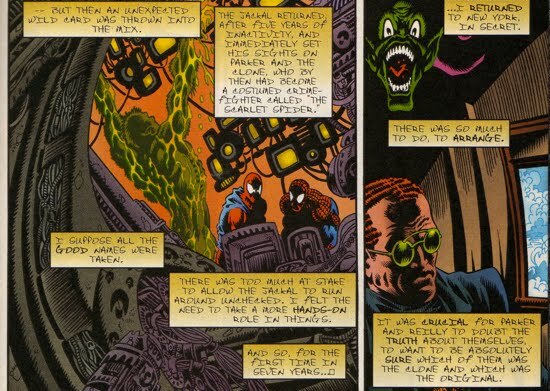 This network enables Norman to do a number of things, one of the most integral for his plot against Parker was learning of the Cabal of Scrier. Norman describes this cabal as a "secret, centuries-old, and very exclusive group of men who shared a common goal: the acquisition of unlimited wealth, power and control". Their ghost-like appearance appealed to Norman, who now saw himself as a living ghost. Norman soon joined the ranks of the cabal and through a "hostile takeover" he becomes their undisputed leader. Osborn states that it was "five years ago" (see Osborn Timeline) that he started his plot against Peter. To initiate his revenge upon Spider-Man, Norman sends one of his Scrier servants to see Professor Miles Warren. The Scrier tells the scientist that he will be able to help him perfect his cloning processs. He even baits him with the potential for Warren to be able clone the woman he so greatly desired, Gwen Stacy. 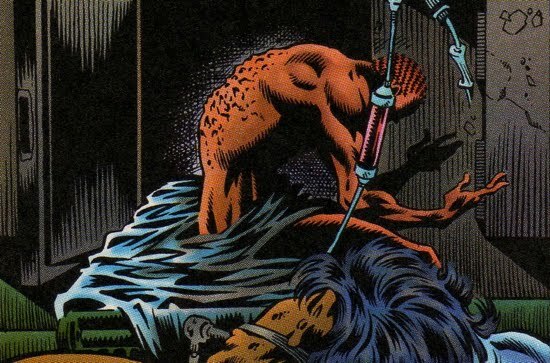 Osborn employs both his information network and his contacts within European scientific community to help Professor Warren perfect the cloning process. When Seward Trainer, an assistant to Warren, is caught stealing data from his mentor, Norman uses that information to blackmail Trainer. Trainer then becomes another pawn for Osborn to manipulate and Norman uses him mainly to disrupt the concurrent plot against Spider-Man that the Jackal (Professor Miles Warren's villainous alter ego) had devised. That explains why the Jackal later erroneously convinces Peter that he is really the clone. Norman claims that he intentionally confused Warren because he wanted to be the one to destroy Peter's life at the time of his choosing, Norman has a thing for control. The Scrier then sends Seward Trainer to befriend Ben Reilly so that Osborn can keep tabs on him as well. Norman's old partner Mendel Stromm resurfaces, however it is later revealed that this Stromm was merely a robot engineered by the former Robot Master himself. This prompts Norman to send his Scrier minions to investigate Stromm's old labs and they uncover that Stromm had tested his super strength formula on himself. Norman, aware of the fact the formula was able to revive him, hypothesizes that Mendel Stromm may be alive as well. 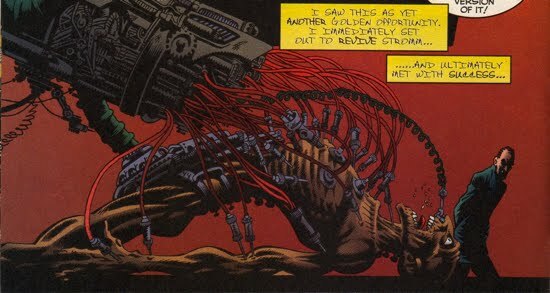 He exhumes Stromm's corpse and finds that the scientist is in a state of "suspended animation" brought on by the formula. Osborn deduces that the differences in the formula the two of them were exposed to are responsible for the different ways they were "kept alive". Osborn builds his old partner a "life support suit of armor" and Stromm takes on the new identity of Gaunt. As Gaunt, Stromm helps Osborn develop innovative holographic technology that enables the Scrier agents to appear to have supernatural powers. 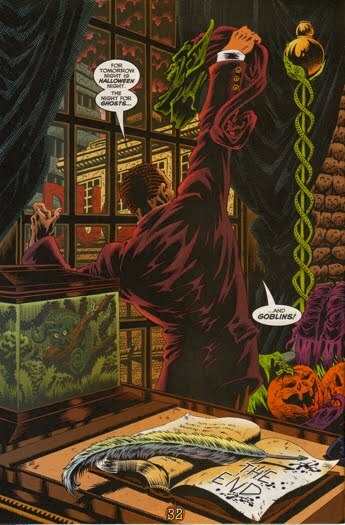 It is around this time, roughly four years after Norman's "death", that Roderick Kingsley becomes aware of Norman's Goblin hideouts and takes on the identity of the Hobgoblin. This event almost causes Norman to return from hiding, but the arrival of Judas Traveller on to the scene compels Norman to remain in exile. Norman views this world renowned criminal psychologist as a "limitless source of power" and thus another pawn to help destroy Peter's life. Through Scrier, Norman sets Traveller up with a team of special operatives dubbed "The Host". 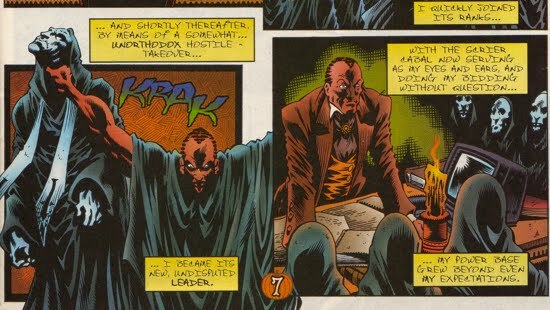 Judas Traveller and his group "The Host" are more pawns Norman employs to manipulate Peter and keep him confused. Peter soon marries Mary Jane and not long after Harry 'dies' from his exposure to a toxic version of the Goblin serum. Norman's plot to ruin Peter's life takes an unexpected twist when Ben Reilly returns on his own accord to visit with Aunt May, who had just suffered a stroke and was in a coma. This saved Norman from having to provoke Ben out of hiding at the appropriate time. 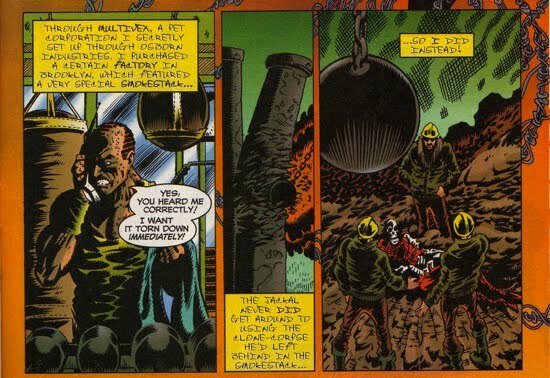 Using his pet corporation Multivex, Norman has the smokestack (seen in Amazing Spider-Man #151) torn down exposing the skeletal remains of the clone that Peter had placed there during the original clone saga. Soon after, Norman gets the members of "The Host" to turn agains their leader, Judas Traveller. And even though Spider-Man intervenes to save Traveller, this act is still effective in removing him from the picture as Traveller soon decides to leave for "parts unknown". During a flashback sequence in American Son #3, Norman was portrayed as disinterested and difficult father toward his son Gabriel Stacy (Gwen's son and twin brother to Sarah Stacy). Gabriel grew up resenting Harry Osborn because he believed that Norman loved him more than he did Gabriel. Norman's biased treatment in regards to Harry led Gabriel to eventually track down Harry and attempt to murder him. The interesting facet to this story is that Harry, who was also exiled in Europe under Norman's safeguard whilst being thought dead back in the U.S., was completely unaware of Gabriel and Sarah's existence. Norman kept Harry from Gwen's twins and vice versa, apparently Norman did not want his 'worlds' colliding. But all of Norman's scheming from the shadows ends as MJ's pregnancy reaches its finality. He plans to exact his revenge upon Parker's child in retribution for what Parker did to Norman's son. The outcome of Norman's plot against Peter's child and his subsequent return to the Spiderverse is discussed in the next section. 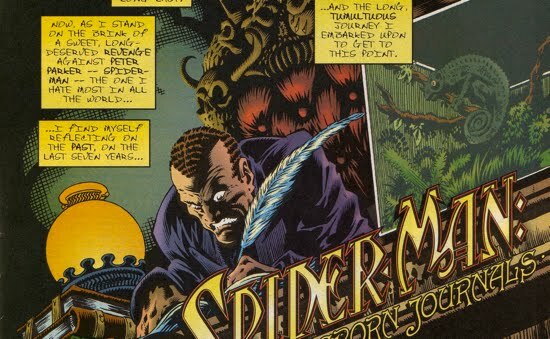 Of course Spider-Man: The Osborn Journal is not totally complete, stories released after its publication added additional nefarious plots that Norman enacted while hidden in Europe. First, Norman is revealed to have been the mastermind behind faking Aunt May's death in Amazing Spider-Man #400. 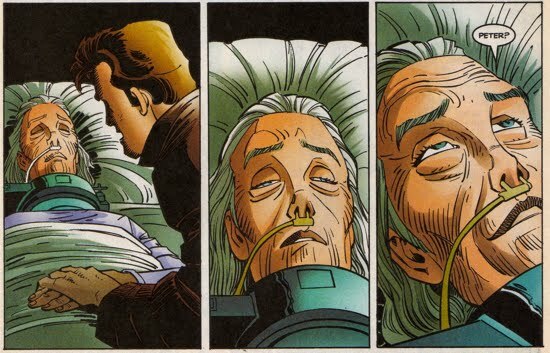 In Peter Parker Spider-Man #97, Peter discovers that the real Aunt May never died and that Norman had an actress play the role of the dying Aunt May...it was the actress's final role. Norman makes no mention of that in his journal even though he alludes to the event as a reason for Ben Reilly's return. Moreover, Norman never mentions impregnating Gwen Stacy and raising their twins in Europe. This is important because it helps explain why Norman chose Europe of all possible places of refuge. It was during Norman's exile in Europe that he had brainwashed the children to think that Peter was their father and that he had abandoned them. These events unfolded in the Sins Past story arc in Amazing Spider-Man #509-514. 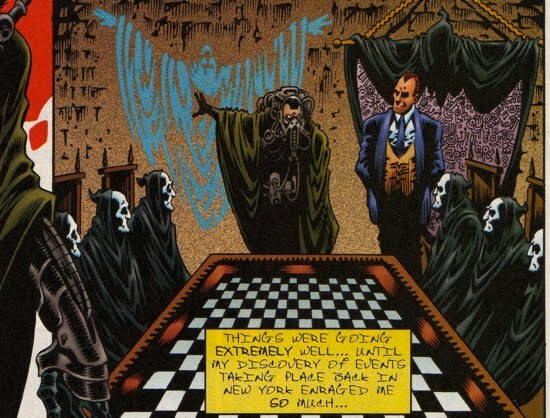 Also, there is no mention of the plan to cover up his son Harry's death as seen in Amazing Spider-Man #581. In fact, Norman's whole reason for emerging from the shadows is to exact revenge for that event. If Harry was not really dead why would he have done that (I guess he really was 'selling it' the way Mysterio requested)? Lesson is: Continuity is never perfect and as the story of Peter and Norman unfolds there will undoubtedly be more conflicting accounts. The purpose of this site is to provide a complete account of the life of Norman Osborn, regardless of whether or not they fit neatly together.